The Metrics window is shown below. This is where you select the build objectives and conditions that will guide the build process. Strategies are ranked during the genetic programming process according to the fitness, which is a combination of the build objectives and conditions selected on this window. The objectives are metrics that you want to minimize (e.g., drawdown) or maximize (e.g., net profit). The conditions are expressed as inequality or equality statements, such as a correlation coefficient greater than or equal to 0.95 or complexity less than or equal to 10. 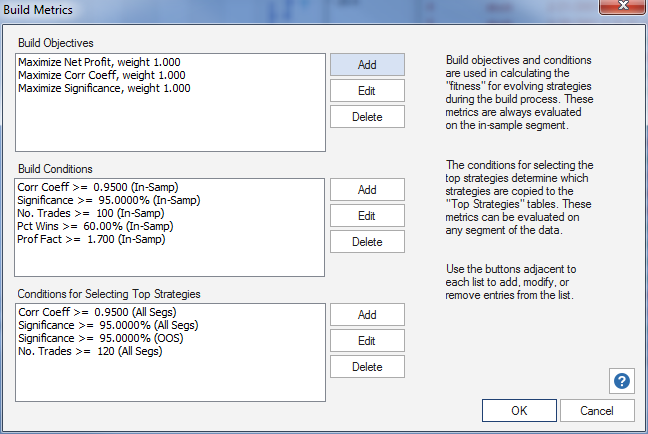 The third list box is for selecting conditions for filtering the strategies for the Top Strategies results tables. The buttons adjacent to each list can be used to add, edit, or delete entries from the list. There are more than 80 different performance metrics to choose from when constructing build objectives and conditions. The complete list is provided in the appendix to the user's guide, available in the help files when you download the trial or in the PDF version.